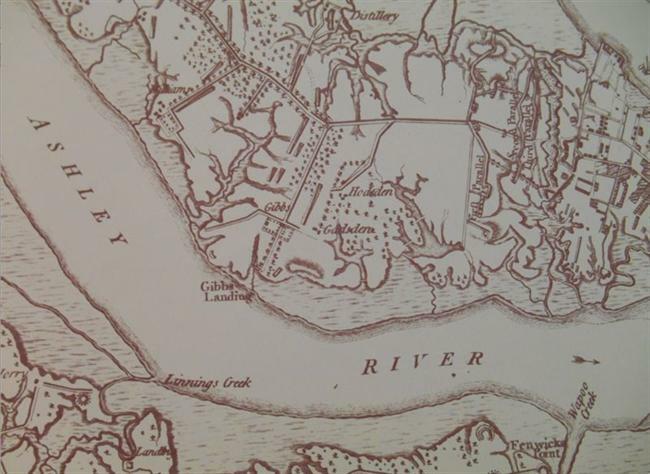 Gibbes Landing, at the opposite site of the Ashley River from the 1670 settlement, was the nearest landing site to Charleston. Gibbes Landing, on a low bluff over the Ashley River, was a principal staging ground for the Siege of Charleston. The main British army and their Hessian allies traveled up the west bank of the Ashley River as far as today's Magnolia Plantation, then crossed over to march down Charleston Neck and attack the city from the north. As they approached Charleston, they were supplied by a detachment of troops who had hauled tools, provisions and building materials across the river from Linnings Creek (Charles Towne Landing) to Gibbes Landing. 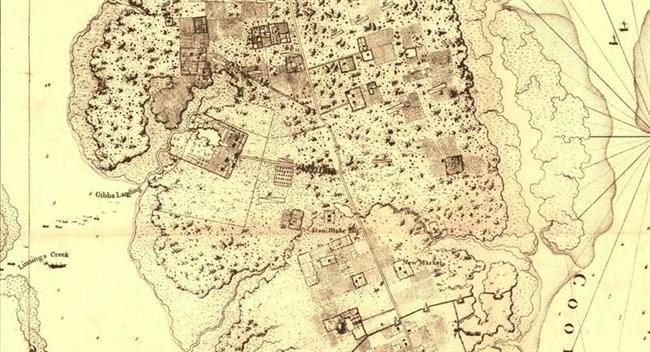 The early history of this tract of land has not been thoroughly researched. John Gibbes owned it by 1769, when a King's Grant of marsh acreage enlarged his "Orange Grove" plantation to 232 acres. Fearing the safety of this exposed location, Gibbes and his wife were not in residence on Mach 30, 1780, when Hessian officers and their men occupied the property. Capt. Johann Ewald wrote of doing picket duty "in one of the most beautiful pleasure gardens in the world. … Half a mile from the house there is a ferry on the Ashley River from which, making use of several creeks, one can get by boat to within a quarter-mile of this plantation." 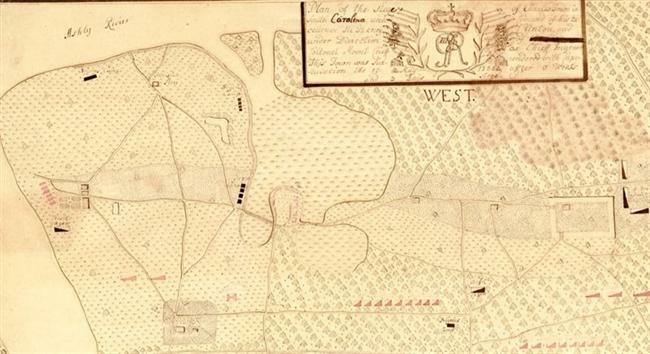 A map used by British General Sir Henry Clinton shows the Gibbes farm and settlement, as well as the military encampments in the vicinity. At some point during the siege, which lasted from March to May, 1780, the Gibbes house was destroyed, either by malicious burning or by accident. A plat made in 1786 shows the ruins of the house, some smaller outbuildings, and remnants of the garden. John Gibbes and his wife Sarah had died without children, and their land was divided for sale in 1786. George Abbot Hall, whose wife, Lois Mathews, was John Gibbes's niece, bought the northernmost thirty-four acres of the Gibbes tract, including the landing. Hall built the grand brick dwelling house known today as Lowndes Grove, but at his death in 1791, his will directed that his Ashley River farm be sold to benefit his daughters. The tract was briefly owned by Lois Mathews Gibbes' brother John Mathews, then by John Beaufain Irving. After several more conveyances, in 1804 William Lowndes (1782-1822) bought the "farm on Charleston Neck commonly called the Grove containing thirty-five acres." 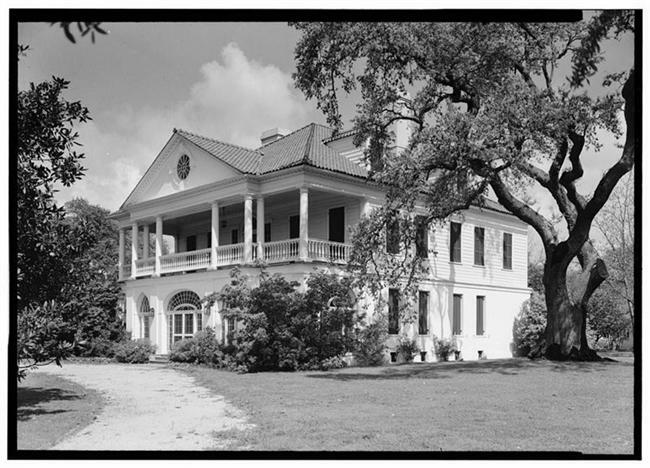 Planter-politician William Lowndes and his wife Elizabeth Pinckney alternated their residence between his Horseshoe Plantation in St. Bartholomews Parish and their summer home at the Grove. During their ownership, the house was remodeled and given its present Adam-style details, and it is still known as Lowndes Grove. In 1881, Frederick W. Wagener paid $12,000 for Lowndes Grove, then described as Rose's Farm or Rose's Garden, about thirty-three acres of high ground and fourteen acres of marsh. The Gibbes Landing site was still part of the property; whether it was usable by vessels drawing deeper than a bateaux is not known. As the Wagener Farm, Lowndes Grove became the site of the "Natural Section" of the South Carolina Inter-State and West Indian Exposition. The eighteenth century house was remodeled for use as the Woman's Building, a number of new buildings were erected, and any trace of Gibbes Landing was obliterated by creation of "Lake Juanita." In 1917, F. W. Wagener sold Lowndes Grove to James Sottile. Settling his family into the late-nineteenth century residence overlooking the Ashley River, Sotille laid out residential building lots on the farmland, calling it Wagener Terrace subdivision. Stockton, Robert P. "Lowndes Grove, A History." Undated manuscript, Historic Charleston Foundation archives. Uhlendorf, Bernard A., editor. The Siege of Charleston with an Account of the Province of South Carolina: Diaries and Letters of Hessian Officers. University of Michigan Press, 1938; rep. ed. Dover Press, 1968. View of Gibbes Landing and Linnings Creek. 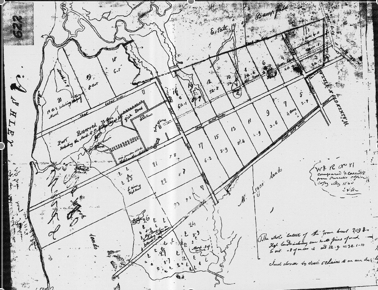 Sketch of Gibbes Farm and encampments. A plat of John Gibbes's Orange Grove Plantation made in 1786 and copied in 1860. Today's Lowndes Grove house and the site of Gibbes Landing are located on parcels 18, 19, and 20, thirty-four acres sold to George Abbott Hall in 1786 and to Frederick W. Wagener in 1881. George Abbot Hall built the Lowndes Grove house ca. 1786.